Vet Innovations, Inc. announced today that it will introduce PortionPro Rx™ to veterinarians at the North American Veterinary Community (NAVC) Conference to be held in Orlando, Florida, from February 4 to 8, 2017. This unique prescribed solution features proprietary portion and access-control technology designed for use in pet feeding within multi-pet homes to help reverse and prevent pet obesity, a widespread and growing health concern. A whopping 58% of cats and 54% of dogs in the U.S. are overweight or obese, according to 2015 research conducted by the Association for Pet Obesity Prevention. To help veterinarians address the obesity epidemic, PortionPro Rx delivers groundbreaking innovation as the only veterinary-grade medical device that automatically dispenses portion-controlled food to a specific pet while preventing access by all others. 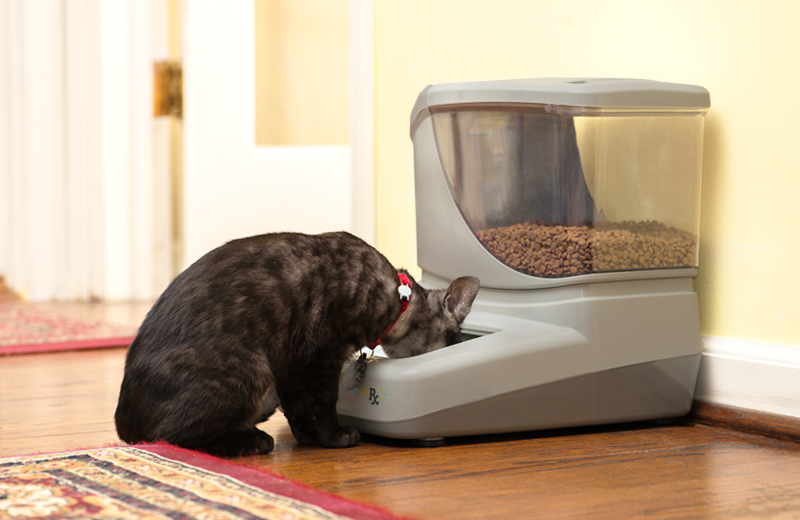 This multi-pet feeding solution integrates Pet Field Communications™ (PFC), Vet Innovations’ patented radio frequency identification (RFID) technology, to identify individual pets and control access to food. PortionPro Rx also makes it easier to feed prescription diets in multi-pet settings. PFC ensures the right pet gets the needed special diet while eliminating the risk of consumption by other pets. All NAVC attendees are invited to preview the PortionPro Rx at the Vet Innovations live demonstration area that will run throughout the upcoming conference. Vet Innovations team members, including PortionPro Rx inventor and longtime veterinarian Dr. Troy Hexter, will be on site to answer questions. More than 90 million cats and dogs in the U.S. are classified as overweight or obese. These pets face increased risks from obesity-linked health concerns including arthritis, diabetes, cancer, and premature death. A key contributor to this epidemic is the difficulty pet parents face in controlling food portions for pets living in multi-pet environments. For more information about PortionPro Rx and Vet Innovations and to view an introductory video, please visit our websites at portionprorx.com and vetinnovations.com, email us at info@vetinnovations.com , or stop by Exhibit 3332 anytime during the NAVC. Vet Innovations is focused on a singular mission: to dramatically improve the lives of pets, pet parents, and their veterinarians through groundbreaking, innovative technology centered on animal wellness. Vet Innovations has developed unique and proprietary technology that controls what pets can and cannot access in their day-to-day living. The system automatically senses and identifies specific pets, enabling them to individually interact with different devices in the world around them. The company’s focus is on robotic-based electromechanical technology that not only simplifies and improves the treatment of pet obesity, but also enhances overall pet wellness. For more information, please visit us at vetinnovations.com, follow us on Twitter (@vetinnovations) and Linked In, or email us at info@vetinnovations.com.